The 15 Star Flag became our official Flag on May 1st, 1795 when two stars were added representing Vermont and Kentucky. The 20 star Flag saw a return to tradition as Congress decided to return to the thirteen stripes, but added stars for five new states. 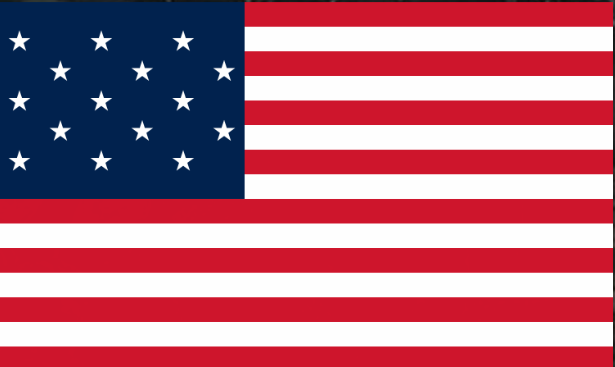 This Flag was also known as the "Great Star Flag" as the 20 stars were sometimes arranged to form a star. 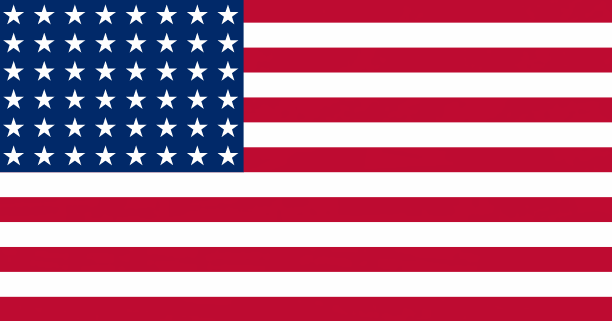 The 37 Star Flag was first used on July 4th, 1867. An additional star was added for the state of Nebraska and it was used for ten years. In 1896, the 45 star flag represented the country with Utah as an official state. This flag was used for 12 years and saw three presidents during its use. On July 4,1912, the U.S. flag saw 48 stars with the addition of New Mexico and Arizona. An Executive Order by President Taft established the proportions of the flag and provided for arrangement of the stars in six horizontal rows of eight each, a single point of each star to be upward. Our modern day flag was first introduced in 1960 when Hawaii was added as an official state and has been our nation’s symbol for over 50 years. It has seen eleven presidents so far. By 1776, The Thirteen Colonies had been in a gruesome year-long war with Britain. When the Declaration of Independence was signed in July of that year, it’s inception marked the birth of our nation. The Thirteen Colonies, now with a strong voice and determination, used the flag as a new symbol. It is one that is still used to this day — a symbol of freedom and the people’s will to overcome. 1812 was the year that Fort McHenry was bombarded and with its fall, rose a significant piece of American literature and symbol of pride. A young lawyer by the name of Francis Scott Key was on a nearby truce ship when he witnessed the attack on McHenry. Although there was great despair over this defeat, Francis Scott Key, and many in his company, found the American flag still intact. He was so overcome by this symbol of hope that he penned the Star Spangled Banner. World War II is a significant time period in the history of the United States. The bloodshed left an imprint in the hearts of those at home and abroad. Before the end of the war in 1945, however, the American people were awarded with a image of hope and strength. The capture of Iwo Jima is one of the most recognized events in the World War II timeline. Two flags were raised and waved proudly at the top of Mount Suribachi. Later in the day, the flag was replaced with a larger flag. The infamous photograph was the inspiration for the Iwo Jima Monument in Washington. On August 28th, 1963, Martin Luther King Jr. (MLK) proudly stood at the Lincoln Monument and gave the famous, “I Have a Dream Speech.” Over 250,000 civil rights supporters gathered together to hear MLK deliver one of the most powerful literary works in American history. His words paved the way for the Civil Rights Movement and voiced the heart of a hurting people. To his right, the American flag waved in the open air as his passion washed over the United States. History was made on July 20th, 1969, when Buzz Aldrin, one of several Apollo 11 crew members, landed on the Moon and raised the American flag. Prior to the mission, the flag was purchased at Sears and was sprayed with starch so that the flag would appear to be flying straight. This simple act of pride has been a significant and fun moment in history. It was 1976 and the Los Angeles Dodgers and Chicago Cubs were in the midst of a final game in the early-series at Dodger Stadium when two men ran onto the field. Cubs player Rick Monday ran towards the men who were attempting to burn the American Flag. Monday swiped the flag from the men’s grasp and carried it to safety. Later, when asked about his brave rescue, Monday stated that his act was a duty to respect the symbol of his country and the people who fought to keep it free. The 1980 Winter Olympics took place during the Cold War. At this time, the Soviet Union hockey team reigned over the rink with a winning streak of three consecutive olympics. American coach, Herb Brooks, took a leap of faith when he created a team of amaetuer players and put them on the ice. The U.S. team defeated the Soviet Union, 4-3. This win was dubbed the Miracle on Ice. As the men celebrated their victory, the American flag was proudly waved around the rink and reminded us that anything is possible. September 11th, 2001 was a time of great mourning in the United States. The World Trade Centers fell after a terrorist attack and two other planes crashed — one in the Pentagon and the other in a field in Pennsylvania. This wound in our nation’s side left the country in a place of grief and sadness. Just hours after the second World Trade Center collapsed, a flag found in the rubble was raised at Ground Zero by three firefighters. The act was captured by Thomas Franklin and remains one of the most prominent photographs in American history. The flag is much more than the material that binds us to it, it is a living symbol of our nation’s greatest victories and darkest struggles. Sown in between each thread of red, white and blue lives the blood, sweat and tears that went into making the United States the great nation that it is.